Love all your quilts, Nannette. I was shocked to see that purple girl/bunny on dot fabric. I bought the blue version of that at a thrift store. It was old and must have been the original vintage print. You have such a good touch with finding the right fabric for the right pattern. I love your "all dressed up" quilt. I should make it for my girls out of the fabric I have used to make all of their dresses. 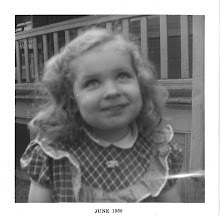 Now I feel bad that I didn't save scraps from each dress I have made over the years. I love the idea of using your Sew Cherry quilt to decorate now...and so happy that your all dressed up is home for good...it sure was gone a very long time! ALL your quilts are made with love--either the fabric, the pattern, or the process--so each is Valentine appropriate! Love them all! So much quilty adorableness. On my list of want to do's this spring is my All Dressed Up quilt from your pattern. I've been gathering bits away for it for a while now. 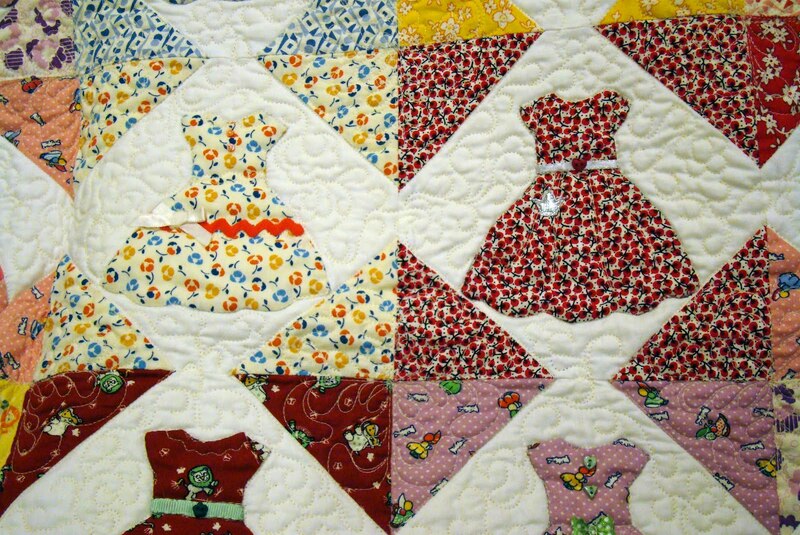 It must have been really hard letting the little dresses quilt go for so long. It is so pretty and all the fabrics are super sweet. The Sew Cherry quilt is pretty, too, but then - all of your quilts are pretty. Super pretty! Well, where have those little dolly dresses been trolloping around??? 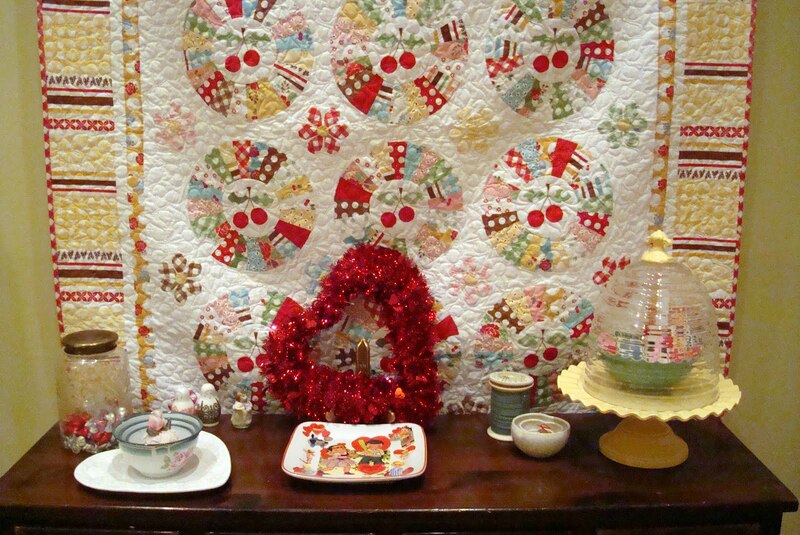 I love that cherry quilt -- what a great idea for February! I love that quilt too! Isn't it wonderful when they come home to stay? Oh Nanette! I just love the quilts. 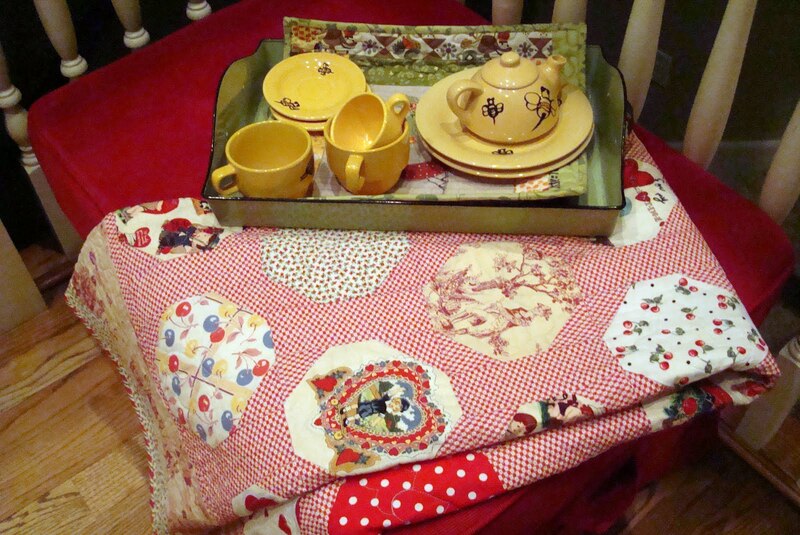 Your little tea set is perfect to set off a quilt. At the cottage, I have no where to put up quilts at the entrance, but my sweetie says he'll make space on one wall. 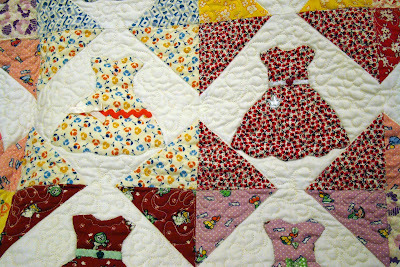 Love, love the little dresses and your creative way of putting this quilt together. Superb, as always! Love your cherry quilt and I'm glad your Dolly Dresses quilt is finally home where it belongs. I do think Cherry Cheesecake quilt looks great in the entry and is a perfect theme for presidents day... And it does look valentiney to me too. Your display looks yummy...You always add such a nice touch to everything. Love all the quilts. I like the one you hung in the entryway. Beautiful quilts! I love your entryway decorations--the quilt is beautiful! 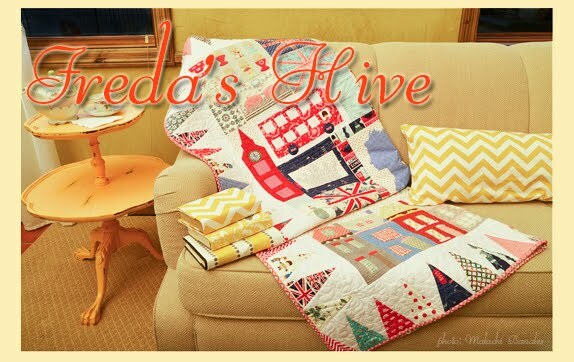 Heck--all of the quilts in this post are beautiful! Your entryway looks so Valentiney charming! Love the new quilt you have hung & that you still have your Valentine quilt displayed. It looks great. So glad you have your All Dressed Up quilt back home. I bought that pattern from you awhile back & now seeing your quilt again, I need to get started on one of my own. So many projects in the works, need more hours in the day! :) Loved this post. Just found your blog. 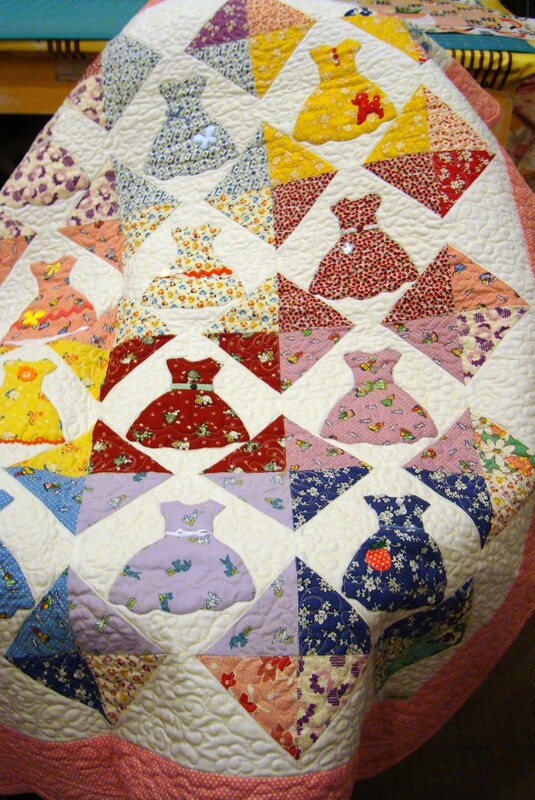 I love the "All Dressed Up" quilt. Do your share/sell this pattern? I have so many scraps from clothes I made for my daughter and granddaughters. I have been looking for a pattern similar to this for quite some time.